Welcome to the 21st century where we can experience anything from movies to online pokies in a three dimension format all from the comfort of our own home. 3D pokies are the latest generation of pokies and while we wouldn’t say they’re revolutionary, they are quite innovative in terms of graphics, with many software providers creating their own versions for online operators to adopt. Granted some 3D products work better than others, but we think when done right, by the right software provider, 3D slots can offer an interactive gaming experience that adds a sense of entertainment to gambling online. 3D pokies are basically video pokies but have 3D graphics and interactive animations which can come to life on our screen. So while players are generally spinning the same standard reels video pokies offer there are additional features such as animated symbols bouncing to life when you win or even animated characters walking around the reels to keep us entertained even when we may be losing. Standard video pokies are generally two dimensional meaning they don’t have any depth to them like the graphics 3D slots offer. For example, when players win on a payline on a 2D slot the audio generally goes crazy and the graphics flash, but thats about it. With three dimensional pokies, when players win an animation with depth to it will appear thus making a more immersive winning experience. There are some drawbacks of 3D slots, predominantly revolving around technology. If you are playing on an old computer it may be harder for these types of slots to work since they use HD graphics. Additionally, some software providers can get it all wrong when it comes to 3D slots. We have discussed a top leading software developer who created their version of 3D slots and our opinion on why it didn’t work. Basically, if the online operator offers software developers which have gotten 3D slots right and you have a strong stable Internet connection, you can’t go wrong. We recommend visiting Guts online casino to play 3D pokies as it offers all of the software providers listed below, so you can experience an array of different 3D slots and see how they compare in terms of who has created them. Additionally, Guts is a mobile-friendly online casino so you can access these slots, as discussed below, via your smartphone and tablet. This online casino has been tried and tested by our team to ensure it is secure, safe, and trustworthy when playing with real money so players can spin the reels with confidence and be sure these slots aren’t rigged in the online operators favour, which many rogue Internet casinos do. Other leading casinos with a top selection of 3D slots are G’day, Thrills and BGO casinos. It can be difficult trying to find 3D slots amongst the array of pokies on offer. However certain software providers have taken it upon themselves to dedicate their resources into creating 3D slots as opposed to continuously producing the same thing with different themes. Why we wouldn’t say 3D slots are a whole new genre, they definitely add to the gaming experience and make it somewhat more fun, entertaining, and interactive. We have found some of the best software providers when it comes to 3D slots to make it easier for you so you only have to pick from their giant catalogues rather than try and figure out what software provider to go with. BetSoft – Betsoft Gaming can be considered the pioneers of 3D slots, though we aren’t quite certain they came up with the concept, but they’ve definitely executed it well. Betsoft have created a line known as Slots3 which offers over 150 3D slots with 3D graphics they claim to be the most stunning in comparison to any other slot on the Internet, combined with intense audio. We have tried a few titles ourselves and have to agree the animations create a sense of depth and the level of interaction with the game is increased. We will list a few of our favourite titles below so you can locate them easily by doing a simple search. Additionally, Betsoft offers all of our favourite features such as free spins, bonus rounds, wilds, and more, but these are represented by entertaining animations which have been created to coincide with the games theme and title. Net Entertainmnet Gaming – Top leading software developer in all things online casino games, so it’s no surprise NetEnt also has a nice catalogue of 3D slots. They have a 3D slot which falls under many categories too including, 5 column 3D slots with free spins, 5-reels 3D slots with free spins, bonus round 3D slots, and more. While they don’t have a specific 3D slot line like Betsoft gaming does they are still popular for their 3D pokies. Microgaming – While this software provider has dominated the online casino realm with its state-of-the-art games, it is dragging somewhat in terms of 3D slots. Yes, we know we are discussing the best, but some people think Microgaming’s take on 3D slots are the best. We just want to inform you why we don’t have that opinion, and what they involve so you can make your own mind up. We think they have fallen behind because generally they wasted time thinking that 3D slots should be seen just like the 3D movies are in that you wear those horrendous looking glasses. We have found some of our favourite 3D slots through trial and error and compiled the best here, along with what features they include so you can figure out which one is for you. Gonzo’s Quest – From NetEnt this 3D slot is an interesting one and steps away from the traditional format of a standard video slot as we mentioned above. An avalanche function replaces the standard spinning reels so the symbols fall onto the reels as opposed to appearing once spun. The theme follows Gonzo in Eldorado, searching for gold and it begins with an intro video similar to which most video slots have, only the graphics are in 3D rather than 2D. Once entering the slot Gonzo sits by the side of the reels and is quite animated, moving randomly throughout the spins. He scratches himself occasionally which can be entertaining, while the symbols represented by blocks, explode when you win. There also is the Free Falls bonus feature which sees players getting 10 free spins and a 15x multiplier. It is quite popular and for good reason, especially with the combination of incredible graphics and audio with some potential generous wins. Pinocchio – We all remember Pinocchio from when we were growing up and if you claim you don’t then you better check to see if your nose has grown extensively for lying. Many of Betsoft’s 3D slots contain 30 paylines, however this one only contains 15 paylines. But this doesn’t mean it isn’t a good 3D slot. This slot features several different modes offering different rewards. 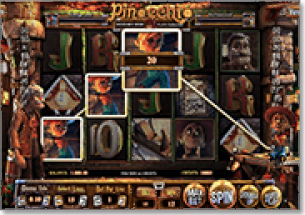 These include the Double Up option, a standard for Betsoft where players guess Heads (Pinocchio’s head as Heads) or Tails (a wooden trunk at trails) to double winnings; the Three Unique Worlds feature, which sees the graphics of the game changing into different places including Gepetto’s Workshop, Pinocchio’s Classroom, and the The Puppet Show, which all reward players differently; the Real boy mode where ‘Wood Boy’ symbols become ‘Real Boy’ symbols which are Wilds; and finally the Fairy Awesome Respins, which offers a respin if players lose with a 5x combination. That was a lot to get through and there is even more, so you can see why this slot is worthwhile, if not for the amazing graphics featuring Pinocchio but for all the features it offers. At the Movies – We know we said that jumbo popcorn buckets are better left at the movies but a small serving of popcorn wouldn’t go astray for this slot due to its cinematic offerings associated with going to the movies. While some may expect scenes from popular movies the theme is actually based on going to the movies and each symbol that comes to life represents something involving the movies such as purchasing moving tickets. This slot has 25 paylines, once again straying from the usual 30. It also features free spins which can offer some generous wins. This slot is perfect for those who just want HD 3D graphics but simple gameplay without any fuss. With a $5000 jackpot up for grabs and 20 free spins, this slot offers simple in the form of quality. Can I play 3D slots with real money? The answer is yes. Australians can play these 3D slots for real money just as they would play any other slot with real money. There is an opportunity to play in free play mode to see if you like the graphics or if your computer can handle the graphics. We recommend playing at our suggested online casinos if playing real money 3D slots, as there are many rogue Internet casinos these days which advertise that they are safe and trick players into depositing money there. Our list has been tried and tested by our team to prevent anything like this from happening so we and our fellow players can feel safe when experiencing online 3D pokies. Can I play 3D slots on a smartphone or tablet? Along with their 3D slots line, Betsoft have also created a ToGo line which involves some of their slots having been made compatible with mobile platforms. This means players can access the 3D slots on a mobile device, including Android and Apple smartphones and tablets. There are a few drawbacks in that not all of the 3D range is available as well as the game play being not as smooth as it is on laptops and desktops, especially if we are playing via a 3G connection. Regardless, they still work and there are enough to keep you busy on the go, but we recommend checking them out on a laptop first for the best experience. Net Entertainment also offers mobile slots in the 3D format, but have the same drawbacks which Betsoft has. We can still play using real money on any platform and if you are accessing the 3D slot catalogue via a smartphone or tablet, we recommend checking out Guts online casino for the best mobile 3D slot experience.